I've decided to release my FIM Metaverse Rule Extension (http://blog.goverco.com/p/fim-provisioning-framework-fim-mre.html) on CodePlex. Basically, this framework allows FIM administrators to do declarative provision without using Synchronization Rules. I often find this useful if you need to synchronizing information on objects that don't go into the FIM Service/FIM Portal. I'll be happy to hear more about your experience with this project and hope that you'll support it moving forward. You can find the CodePlex site here. The guys over at Predica has made a nice tool for diving in to the FIM Service and meet all your XPath cravings. It looks like a tool that is nice to have in your repository. All donation received at this blog will go uncut to the H.C. Andersen Childrens hospital in my hometown of Odense, Denmark. They do a really wonderful job with the children there and I'd like to support that work. Therefore, if you're using either the MARunScheduler or the PowerShell Management Agent, please donate anything you can - even very small donations (a few dollars) will help the cause - and I'll make sure to include your name in the letter that will accompany the check for the hospital - no matter the amount. Hoping for your support before Christmas / December 21st, 2012 - and thanks to all of you who have already donated. I'm very happy to announce that version 4 of the Granfeldt PowerShell Management Agent is available for download. This new version has support for deltas and can scale very nicely. This Management Agent has proved to be a regular switch army nice for getting FIM to talk to systems that have no Management Agent. There have been reports from around the globe of people using this Management Agent for managing anything from Office 365 users, Lync users, Exchange mailboxes to DHCP scopes. I'm very happy to see the 500+ downloads of the previous version here in 2012 and trust that this new version will also reach that number. The popularity of this Management Agent also mean that I do get a lot of support questions and kind requests for help in constructing the PowerShell scripts for use with this MA. I cannot accommodate everyone, so please do not be surprised if I don't answer your mail with support questions. As a lot of people around the world are using this MA, I recommend that you direct your questions to the general FIM 2010 forum where a lot of skilled FIM guys and girls are ready to help. I'm also monitoring that forum and will try to answer questions from time to time. I'm currently trying to gather a small amount of donations for a good cause/charity here in 2012. So if you're using the PowerShell MA and download the new version, then please do consider making an appropriate donation. By the end of the year, I'll donate the amount collected to a childrens hospital here in my hometown, Odense, Denmark - with appropriate credit to donators. Finally, I want to thank Kent Nordström and Jason Taylor for their assistance in rooting out any obvious bugs for this release. So now, go read all about it and get it here. And please help spread the word on Twitter and other appropriate medias. A few days back Microsoft released another rollup hotfix for FIM 2010 R2. 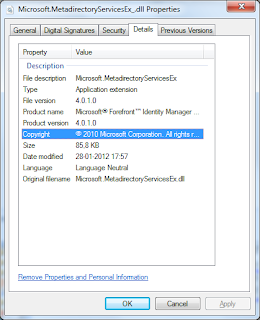 It includes some important fixes and particular it should be able to fix the error introduced in 4.1.2515.2 where the Microsoft.MetadirectoryServicesEx.dll assembly was changed but the version number didn't. Are you actually using Kerberos in your FIM setup? When installing FIM 2010 R1/R2 it is recommended to use Kerberos throughout the installing; in fact some parts of FIM just won't work without it. But how to you actually verify that you're accessing and getting validated on your websites using Kerberos and not 'just' NTLM? I want to point you in the direction of a nifty little tool that I always use to verify that I'm using Kerberos on, let's say, the FIM 2010 R2 Password Reset and Registration Portals. Have a look at it on Michel Barnevelds blog for his Kerberos Authentication Tester and go check those websites/services of yours. I've just released a new version of the MARunScheduler. This product is normally free and will be free again at the start of 2013. However, for the rest of 2012 this new version can only be purchased. All revenue generated from purchases of the MARunScheduler will be donated to charities. Hopefully, I'll be able to announce that the MARunScheduler has helped a charity by the end of the year. From download statistics (more than 150 downloads currently), I gather that my Home Directory Management Agent (MA) is very popular and I am very happy about that fact. However, last week Microsoft announced that the XMA framework is deprecated. The Home Directory MA is written in this now deprecated XMA framework. Unfortunately very few people write to me of their usage of the MA, so I'm unable to contact them directory about this fact. If you're using it, you will eventually have to replace it with an updated version and probably sometime in the near future. Leave a comment on this blog entry to let me know, if you're using it - and if there is enough demand out there, I will definitely have a look into building a newer version in ECMA2. Release of the new version 4.0 of my PowerShell Management Agent (MA) is near. I would like to do some final testing and I'm looking for anyone, who like to try it out and give some feedback (and help eliminate any bugs) before I release it. If you're interested, then leave a comment on this page or send me an email on soren@granfeldt.dk - and I'll get a pre-release version of the MA to you for testing purposes. Microsoft just announced on MSDN/TechNet ( http://msdn.microsoft.com/en-us/library/ms698807(v=vs.100).aspx) that the FIM 2010 Connected Data Source Extensions or XMA/ECMA1 is marked a deprecated feature. This effectively means that any Extensible Management Agents build on this old framework in a near future is not supported and would have to be replaced by a version build on the 'new' ECMA2 framework (http://msdn.microsoft.com/en-us/library/windows/desktop/hh859557(v=vs.100).aspx). So if you have build a Management Agent on the old framework, you should rewrite it for ECMA2 and if it is one supplied to you by a vendor then you should contact the vendor to see whether or not a newer, supported version is available. And if your vendor does not have a version ready, you maybe need to push them for one. So, in my opinion, you should actually start this work right now as it probably could take a while to plan, test/build and introduce a new MA (maybe with missing or different features) into your FIM production environment to replace the deprecated XMA's. So there is absolutely no need to wait, take action today. So far there are no indications of whether the possibility to run ECMA/XMA MA will be removed completely from the product, so we'll have to see what Microsoft decides on in that regard. Hey, I'm using your Home Directory MA - what should I do? So again, if you're running XMA's today, take action to get an ECMA2 version in production as soon as possible. Let me make this clear from the start. This 'fix' is NOT supported by Microsoft. I've seen a few people in the forum have this problem and have also run into this issue at a few of my customers. People are having trouble running ECMA2 Management Agents after applying this hotfix for FIM 2010 RTM. One of the threads dealing with this problem can be found here. There are numerous very good suggestions on how to fix this problem and all of them should be checked for sure as they may be the cause as well. The first time, I ran into this problem was late at night and there was no time to do extensive troubleshooting. However, today I ran into the same problem and with good help of the customer representative, we found a remedy and a possible cause for the problem. Now, I'm pretty sure that this is NOT supported by Microsoft, but if you're in a tight spot and pressed for time (we needed to get a production system up and running) - well, then this may just help you. The problem seem to appear because the file Microsoft.MetadirectoryServicesEx.dll is NOT updated when applying this patch (it sits under Bin\Assemblies). The reason for the lack of updating is properly that the new version has exactly the same version number as the existing file (if you're on patch level 4.0.3606.2). And then - even though it is a newer file - Windows Installer/MSI won't update it, because it has the same version number and MSI then assumes that it doesn't need updating. The previous file has version number 4.0.1.0 and is dated Jan 28, 2012 whereas the new file also has version 4.0.1.0 but is dated Aug 3, 2012 -and they are different. As far as I know MSI will only use version numbers and not time stamps (like in the old days) when comparing (but do correct me if I'm wrong) and thus it will not update the file. Effective result - no update takes place effectively leaving version differences between Microsoft.MetadirectoryServicesEx.dll and Microsoft.MetadirectoryServices.dll. And your XMA/ECMA's break due to this mismatch. Now for the remedy. And I state again that this is NOT supported by Microsoft, but helped me get back up and running with the production environment - and we're moving to FIM 2010 R2 shortly, so we're gonna just let the existing system sit for now and not fiddle around with it anymore. And luckily, after restarting the FIM Synchronization Service, we were able to get our ECMA's running again. This is the second year in a row, and trust me - I'll do my best to continue to honor the award. Thank you, Microsoft ... and those that supported me for this award. I like to save the configuration of the FIM Synchronization Service from time to time; whether it is before patching, to move the configuration to a test/production environment or for any other reason. For that purpose, I've created a script that will help get the configuration exported quickly and easily. I do love Powershell, so the script is of course written in Powershell and makes use of some out-of-the-box CLI tools like srvexport.exe and maexport.exe (the path for these utilities are hardcoded in the script, so you may want to change these if your installation doesn't use the default installation path for FIM Synchronization Service). The script does not export the encryption key, so remember to do that as needed. So you want to do codeless provisioning with FIM? No problem you just go ahead and use the built-in features of Synchronization Rules. However, if you don't want to use Synchronization Rules for whatever reason, you may want to take a look at FIM Metaverse Rules Extension (FIM.MRE). It's basically a framework that's I've been evolving over time (since MIIS/ILM) and now decided to release for public use with FIM. Basically, it allows you to do provisioning in the FIM Synchronization Service without using Synchronization Rules (SR's). You could, of course, combine this framework with SR's and built a great synchronization solution with the two playing together side-by-side. There is an initial version 1.0 of FIM.MRE out with documentation (you can find it here http://blog.goverco.com/p/fim-provisioning-framework-fim-mre.html). Documentation and code will evolve as I expand it for my upcoming FIM projects and I'll try to release in regular cycles. It is already being used at some of my customers and more will probably adopt it in the near future. So, give it a go and let me know what you think. And please feel free to leave suggestions and comments on the page to encourage further development. It clearly does make a difference if you, like Jorge, support and comment. He left a few suggestions for future versions of the MARunScheduler on the official page and that triggered me into to adding one of his suggestions. So now there is a small update to the MARunScheduler. The update (version 1.2.0.0) includes options to specify which weekdays a thread or an item should be active. Also, a little bug on Clear Run History was fixed. And please, consider following Jorge' example and share your thoughts on the product. You can see more on how to support this product on the official page and get your copy of latest version of MARunScheduler. I was given the chance to read through the "Microsoft Forefront Identity Manager 2010 R2 Handbook" only when it was fresh out of the press. And after many years of doing ILM/FIM projects, I must say that this book is a great reference for system administrators seeking a deep and highly technical knowledge of Forefront Identity Manager 2010 R2 and all its many facets. Forefront Identity Manager 2010 R2 (or FIM) is a very big product. Too truly master it, you have to have a solid amount of experience with infrastructure (not only Microsoft) and also understand processes around the life cycle of users, groups and other objects in complex infrastructures and organizations. When doing FIM implementations is nice to "have something to hold on too" - a reference and maybe starting point. And this book is just that. 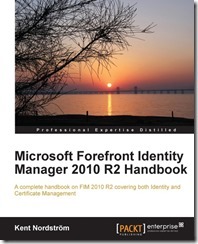 The title of the book 'Microsoft Forefront Identity Manager R2 Handbook" is spot on. Kent has written a book that you truly can use for the many different aspects of a FIM implementation - ranging from the installation process itself all the way to administering and maintaining the system in production. And its a book that you can come back to for thoughts on "how to". Reading through the book, you really get the feeling that it is thought through and it is based on many years of real life experience and the troubleshooting section of the book proves just that. The book is comprehensive and covers all the features of the product, including Certificate Management, which you don't see covered in writing very often. This book does a really good job of showing good, practical examples on how to actually configure FIM with different systems, i.e.Exchange and Lync and gives you an idea on how to crunch "strange" input data, a thing, that you are very likely to run into in real FIM deployments. All this is done in a way that you potentially (with a few modification, of course) could apply in a production environment. The book feels well-structured and has a good flow. But you can also use it as a "goto"-guide for the different aspects of FIM. It is a must-have for those wanting to engage with FIM. Don't get it only for the technical stuff but also for the vast real life knowledge that Kent has surely put into it. This book can really support those that wants "to get FIM". FYI: You can get the book here. Along with the online version of the manual for MARunScheduler, I've also released a new version of the product. The version includes new options for more granular scheduling. You can find the download in the last part of the manual, which can be found here. Recently, I've had a customer ask the question and I've also seen a few similar questions in the FIM 2010 forum. How do I change the URL for the 'Register for password reset' link in the portal? Please note that you need to do an IIS Reset after changing the value. 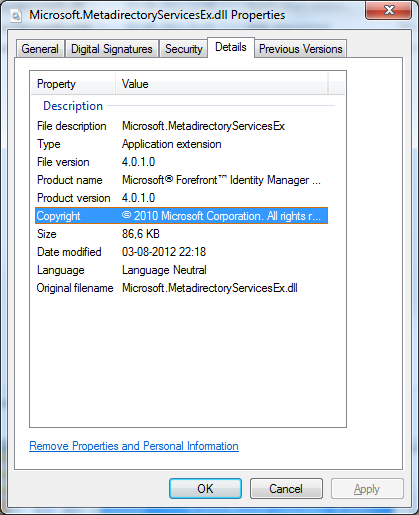 A hotfix rollup package (build 4.1.2515.0) is available for Microsoft Forefront Identity Manager (FIM) 2010 R2. Once again, I find myself in a discussion of setting up the FIM Active Directory service accounts to only have the minimum permissions needed for the job. I won this time (again) - and I'm now finding my self creating PowerShell scripts to make sure that the service account used for the FIM Active Directory MA only has exactly the permissions needed for it to be able do it's work. I'm using DSACLS and PowerShell for the script/job. If you're not to familiar with either above, you can find very good inspiration in this blog by Paul Williams. And remember "To script or NOT to script, that is a stupid question"; now go and restrict your service accounts in FIM..! 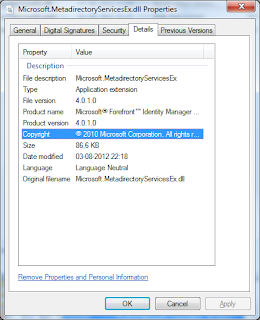 Is the Best Practice Analyzer for Forefront Identity Manager 2010 R2 enough? No. You know it's been a good vacation when you miss out on some of the good news. I missed the fact the Best Practice Analyzer for Forefront Identity Manager 2010 R2 was released. A lot of Microsoft's product has these kind of tools these days and a lot of installations will benefit from it. However, having a tool like this does not mean that you can just lean back and trust the mechanics - you still have to apply common sense and take into account special environmental and infrastructure specifics. So, if you had a good vacation like me and missed out too - then take a good look at it and check out whether it could do your installation good. Read more about here. A customer of mine needed a Management Agent for handling their Office 365 users through FIM 2010 R2. I decided to use my PowerShell Management Agent for the task. This seemed like the straight-forward solution since managing users in the Office 365 setup is basically just a bunch of PowerShell CMDlets. You can get Office 365 CMDLets here. The solution very simply just operates on one boolean attribute (IsLicensed) and provisions / deprovisions based on this flag. I've used the FIM Portal to model the business rules through Set's and MPR's to set this flag on the users that should and shouldn't have an Office 365 account. I have removed customer specific code from the scripts, but have decided to share the scripts with the community. Hopefully, you can use these combined with my PowerShell Management that is also available. For more information on how to use the scripts with the PowerShell Management Agent, please refer to the documentation for the Management Agent. Any feedback is appreciated and please share findings, tips and tricks through comments on this blog entry, so that other may benefit from these as well. You can get the scripts in the download section for the PowerShell MA and they are pretty much ready to use out-of-the-box, but please review and test them properly before putting into production. See you in the cloud..! I'm pleased to announce that my PowerShell Management Agent (MA) has been released. This version is a completely rewritten Management Agent and is now built on the ECMA 2.0 Framework that is included in the FIM 2010 Rollup 2 and of course in FIM 2010 R2. The PowerShell Management Agent is very flexible allowing you to define your own schema (using a PowerShell script) and run scripts for Full Imports and Exports. The download includes complete documentation, so I won't write more information in this blog entry. You can get the bits here. Please note that I'm not able to offer free support for this, however, you can sign up for official support for this Management Agent if you do so wish. Please contact me for more details on a support agreement. A small bug was discovered in the PowerShell Management Agent (MA). The bug was about type casting different attribute types than strings. If you're only flowing attribute values of type string to the MA, you wouldn't have noticed this issue. However, the issue have been fixed and you could consider updating to the newest version. Today, I again utilized my 'old' lookup-workflow. But I had to make a minor adjustment (or improvement as it may be) to make it support other target attributes than strings. If you didn't know about the little helper workflow, then have a look at my old post on this which has a good explanation of it (and where you can find the bits for download as well). I'm pretty sure that you'll find it a helpful tool. "FIM 2010 Update Rollup 2 (build 4.0.3606.2) contains a feature that is intended to improve Query performance in the case of certain complex queries. This “tabular functions” feature is turned off by default. The product team wanted to get experience among a controlled group of customers before announcing the feature for general use. However, we inadvertently included information about this feature in the original KB for Update Rollup 2 and have since removed it. However, we understand that information about how to turn on the feature is circulating among the FIM community. Once the feature is turned on it cannot be turned off. Since it is likely that typical installations will use this query pattern we strongly advise customers NOT to turn on the Set Partition feature. We will update the community as we understand the issue more completely and have developed a recommendation for addressing it." As you can see, it is strongly recommended NOT to turn on the Set Partition feature - and that it cannot be disabled once activated. You can and should follow the thread in the FIM Forum (including the excerpt) here. Once again, I bumped into the problem described here (http://enterpriseadminanon.blogspot.com/2009/05/that-admincount-adminsdholder-and.html) when scheduling export runs for the Active Directory Management Agent. I decided once and for all to create a one-liner PowerShell command to help me with this problem with missing inherited permissions, adminCount and protected groups (read more about it in blog article referenced above). The right solution would of course be to create administrative account for the user that have this problem, but often times I'm unable to implement this organizational change as part of the project because it occurs extra task, such as new delegations in Active Directory and such. At one customer, I've put this in the Run Profiles (or MARunScheduler pre-processing job) scheduled task to make sure that necessary permission are present before export from FIM is run against the Active Directory. Hope this solves some frustration for some FIM admins out there. I'm pleased to annouce that a version 2.0 of my (apparently popular) PowerShell Management Agent is released. The old version only supported exports, but this new version also supports imports (only Full Imports) giving you the option to do a lot of data source interaction in pure PowerShell. You can read much more about the inner workings of the Management Agent in the documentation included in the downloadable. You can find the binaries and documentation here. If you have feature requests or find bugs, please let me know. A customer of mine recently requested a report of pending exports before they wanted to put FIM into actual production. Now, it's pretty easy to just generate a log. On your Run Profile under Set Log File Options, just select 'Create a log file and stop run. Do not export to data source (test only)' as shown below. However, the output log file is in XML format. In my opinion, you can't present this to a customer but it's a great format for further processing using Powershell or similar. I chose to create a simple XSLT for formatting the output. This is not the HTML report to rule them all, but it's a start and you can edit and change the HTML as you like. For simple transition, use an internet browser. Just edit the FIM export file using Notepad and put this line in as the second line ot make a referral in the XML file to the XSLT file. Remember to change the filename in the HREF tag if you have renamed the XSLT file.